Brandon Beck submitted this photo and caption. 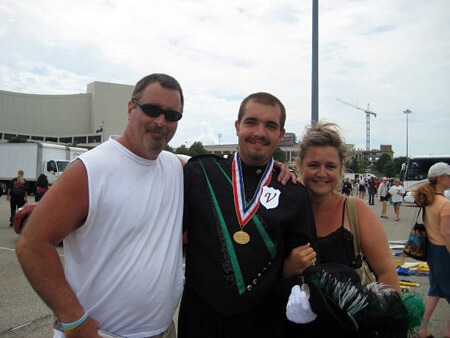 This is a photo of myself, Brandon Beck, and my parents at the 2008 DCI World Championships in Bloomington, Ind. This past summer I was the assistant drum major with the Santa Clara Vanguard Cadets and had the summer of my life. Being at World Championships was absolutely incredible and winning the World Championship title was something I will never forget, but having my parents there to see it made it that much better. Thank you to all my fellow corps members for making the summer incredible and thanks to DCI also!